An era of walking robots that can help people with physical disabilities, take on dangerous missions, or aid in disaster response is about to begin, experts say, as recognized recently by Popular Mechanics in honoring MIME roboticist Jonathan Hurst with one of its “Breakthrough Innovator” awards of 2012. The science in this field is rapidly expanding, said Hurst, an assistant professor of mechanical engineering at Oregon State University, who received the award along with his colleague, Jessy Grizzle, at the University of Michigan. Ten awards were made to scientists and engineers around the nation. 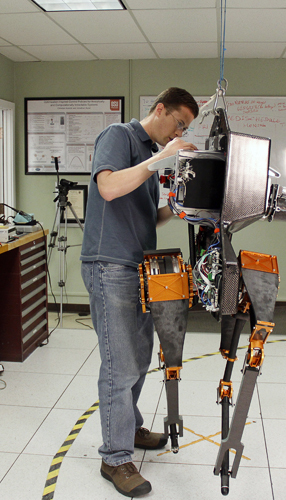 The researchers have built two walking robots, MABEL and the next generation model, ATRIAS. In each case, the technology is based on a fundamental understanding of how animals walk and run, using minimal energy to accomplish a maximum of locomotion and sensory response. Hurst said walking robots are about where the automotive industry was 150 years ago – full of promise, with a number of new inventions and about ready to take off. Beginning with funding from the National Science Foundation for MABEL, and continuing with $4.7 million from the Defense Advanced Research Projects Agency, the OSU and Michigan experts worked from principles of animal locomotion. The mechanical system closely interacts with the software control system, such as fiberglass springs working together with computer control to create efficient and stable walking and running gaits. “So far much of what we’ve done has been with computer simulations, as we spent the past three years designing and building ATRIAS,” Hurst said. Robots that ultimately can walk and maneuver over uneven terrain have a range of possibilities, the scientists say. One would be helping to power prosthetic limbs for people, or use an exo-skeleton to assist people with muscular weakness. But there could also be applications in the military, in disaster response, or any type of dangerous situation. For something that humans usually learn to do by the time they are a year old, walking is still a mystery to most scientists. The complexity of sensory and mechanical input from nerves, vision, muscles and tendons has challenged the most sophisticated concepts in robotics. Members of the Dynamic Robotics Lab at OSU, and members of Prof. Jessy Grizzle's lab at the University of Michigan, during a collaborative visit to OSU. MABEL, however, is able to run a nine-minute mile and step off a ledge. ATRIAS is even lighter, faster, and has three-dimensional motion capabilities. Some of these advances have been possible, Hurst said, because the OSU and Michigan researchers took a step back to better understand the fundamental forces at work before even trying to build something. Most robots today work in a very static or highly controlled environment. But humans live in a mobile, unpredictable world, and with further advances robots may soon be able to join it.